Not long now (as I’m sure you can tell)! We’ve been running around like crazy doing our last minute errands and organizing the nursery. I’m worried that by the time this little guy arrives, we’re going to be exhausted! Mom readers out there, any advice for soon-to-be parents? I wore this for a Georgetown jaunt when I managed to pick up some adorable goodies on sale at Egg by Susan Lazar (must make mental note to check back again around the same time next year). Afterward, B and I grabbed a late lunch at Mike Isabella’s Pepita, which was yummy, but honestly I’m really looking forward to coming back and trying their creative cocktails when I’m not preggers. Hope you all are enjoying your September so far! Oh you are so gorgeous! You will be just fine. Don't worry too much about the details and the "need to-do's" because a lot of things people tell you that you need to do or need to have you might not end up needing or using. For now I say rest and take it easy–you will need that energy when that little pumpkin comes along! Thanks for the advice! Hoping to get a little R&R this weekend! i love those oxford shoes. The metallic finish is so chic! That counts for a lot because I feel like I'm carrying around a bowling ball! 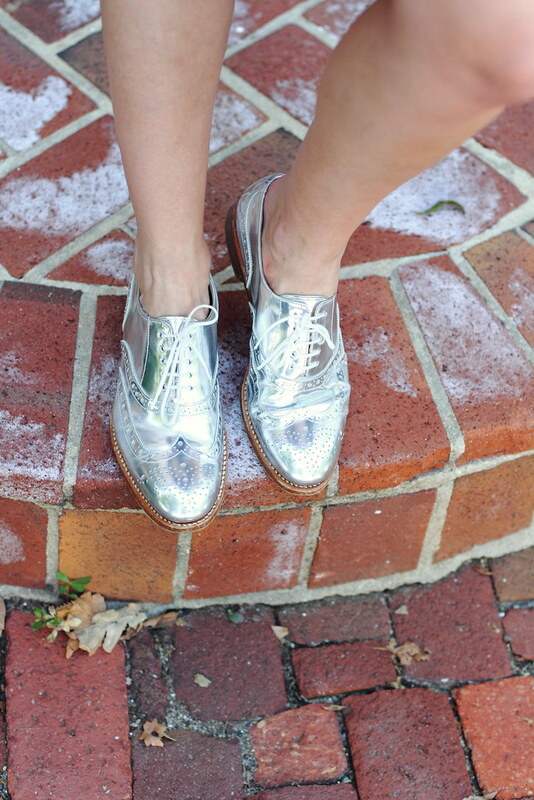 love the metallic oxfords and the mirrored sunglasses! Ooh, those shoes are so fun! And the print of the dress is super cute. And yayyy for all the final preparations!! Super exciting! I love the shoes…such a pretty outfit! Aaawww! So excited for you!!! You look so cute!!!! Adorable outfit. I love the silver shoes. this is so lovely and chic!! great dress! 😀 you are looking more blooming, dear! 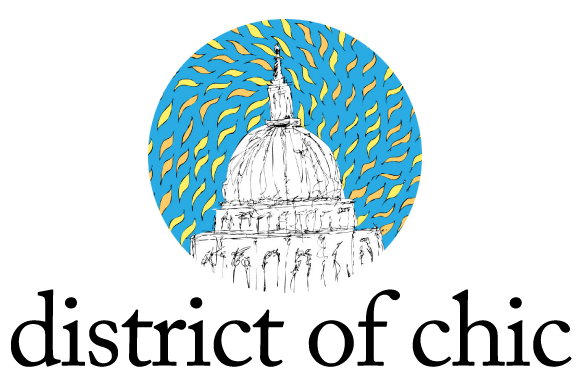 You have to stop being so dang chic! 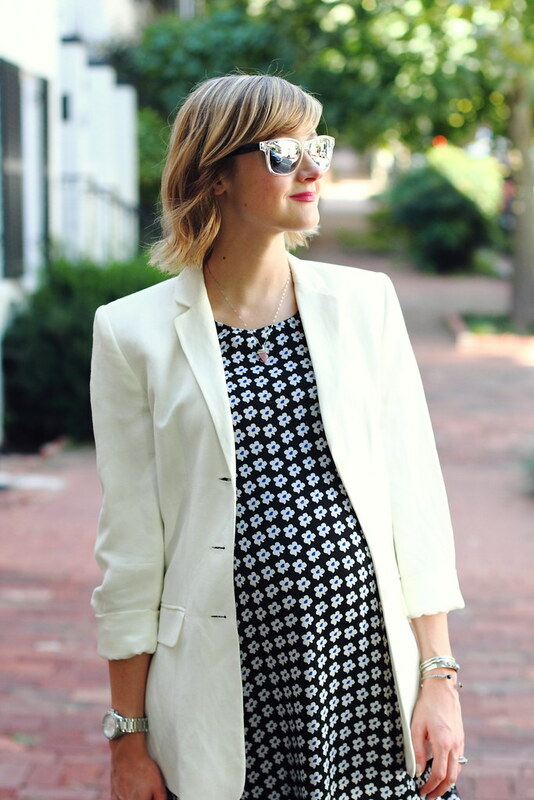 I have a secret baby/maternity board and I could seriously pin every outfit you post. Love the white blazer and silver shoes. Style overboard. Your hair looks fabulous! Also love how those silver flats pop up the whole classy look. 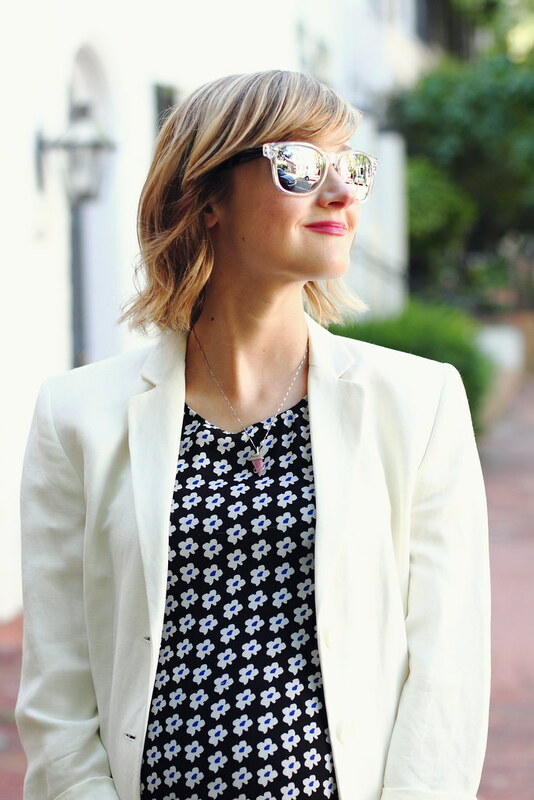 loving this dress + blazer mix. so cute paired with the flats!